BOSCH UNIVERSAL Slicer - Shredder Slices and Shreds directly into its own bowl. Use this as a smaller mixing bowl with the additiion of the whisk assembly sold separately. 3 discs: thick and thin slicing, fine and coarse grating, and french fry slicing. Will need adaptor to work on the Concept 7. Selection Tips: Bosch Slicer Shredder vs. Food Processor The Slicer Shredder and the Food Processor are the two most popular large accessories for the Bosch Universal Mixer. Customers who don't want to purchase both often ask us for help deciding which one would be better for them. Although these two Bosch mixer attachments do many of the same things, there are differences. So here are some thoughts that may help you choose. The Slicer Shredder's 12 cup capacity is more than twice the Food Processor's 5 cups; that might matter if you need to do large batches. Both use stainless steel disks that mount just under their lids to slice and grate the same wide range of fruits and vegetables, with the difference that only the Slicer Shredder offers a french fry disk. 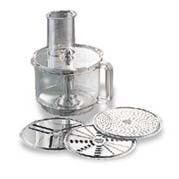 The Bosch mixer's Food Processor also allows you to leave out the disks and instead drop in the bottom-mounted food processing blades which will let you cut foods into pieces larger than the Slicer Shredder does -- the longer you run the machine, the smaller the pieces become. Lastly, the optional Whip Drive shown above allows you to do small whipping jobs with the Slicer Shredder on your Bosch mixer-- which can be very handy if your larger mixing bowl is in use. The Slicer Shredder is the more popular of the two, by a factor of about two-to-one. If you still have questions about these or any of the other Bosch Universal Mixer accessories, please give us a call and we'll be happy to help.